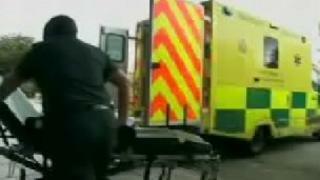 A delay in sending an ambulance to a rugby player with suspected head and neck injuries has upset his club. The teenager was injured at an under-17s league match at Wadebridge Camels Rugby Club on Wednesday evening. A first responder paramedic arrived 20 minutes after the 999 call was made but it took a further 20 minutes for a fully equipped ambulance to arrive. South Western Ambulance Service said the patient was conscious and his injuries were not life threatening. It said a category 'A' call - which requires an eight-minute response - is for patients who are not breathing or are considered to be in immediate danger with a life-threatening condition. "This was not the case during this incident," a trust spokesman told BBC News. "The patient was never unconscious or even semi-conscious - he was talking in full sentences and responding to commands throughout and a 19-minute response was appropriate." The spokesman said it was unfortunate the ambulance took longer to arrive and said it was because the local ambulance crew was not on station and also due to "geographical location and workload". But rugby club secretary Matt Bailey said he believed an ambulance should have been dispatched straight away. "Obviously I'm not medically trained, but I'd imagine in any instance where there are suspected head and neck injuries the time of potential treatment would be extremely important," he said. "The fact that the actual land ambulance didn't arrive for nearly 45 minutes after the incident to provide transport is a bit of a concern, I'd say." South Western Ambulance said the young casualty was treated at the scene for a neck injury before being transferred to the Royal Cornwall Hospital at Treliske in Truro. He was later released with cuts and bruises.